Home / Native American Indian Jewelry For Sale / Native American Bolo Ties For Sale / Royston Turquoise Bolo Tie – GIANT Bolo! Royston Turquoise Bolo Tie – GIANT Bolo! HUGE Royston Turquoise Bolo Tie! Impressively large and completely beautiful turquoise bolo tie. Expertly framed by Native American jewelry artist, Leonard Nez (Navajo), is a wonderful 242.5 carat Royston Turquoise stone. GORGEOUS. Bolo comes with a 47″ braided black leather tie with stamped sterling silver tips. 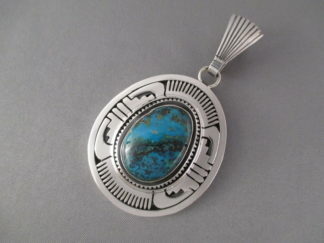 Exceptionally well-crafted and completely unique hand-made sterling silver bolo tie with Royston Turquoise.